A new blend of red and flower teas, Tibet Dream has evoked the imagination of many as its red deep colors remind the Chinese of the deep red robes of the Tibet Monks. This blend is an exceptional combination of a red/black tea with a floral after-taste. Sweet in the palate and mild, this is a must-drink blend to the ones that can appreciate the qualities of superb tea, from the region of Fujian. Tibet Dream is a great relaxing drink that is said to refresh your mind and body. Dry – It looks like dried Marigold Flowers or something similar. Maybe even a mini Dark Daisy or something. It’s incredibly light-weight and fluffy. It smells like Flowers, Fruit, Hibiscus, and Herbs. BUT…there isn’t any Hibiscus IN the loose leaf mixture! VERY interesting! Once I poured water on top to infuse this I noticed the centers of the ‘flower’ puffed out even more. Much like a tea I once had from teaNY long ago! The yellow-orange flower petals expanded from the water and flopped-out and drooped over the puffy center. Post infusion – the tea liquor is that of a light-medium red-brown. A very nice shade! The tea taste itself is rather different than I anticipated. It’s Creamy and floral…not an old-lady flower-perfume type floral, but not a Jasmine either. I want to say it somewhat resembles a “cousin” to a chamomile type flavor but that might be a stretch as well as hard to comprehend unless you were to try it yourself. It has gentle fruity notes as well as some sort of likeness to the most mellow and most pale hibiscus you’ve ever tasted…BUT…REMEMBER…I really don’t see any hibiscus in here! And I’m not saying it’s that stereotypical tarty hibiscus flavor either…I’m just not completely sure how to describe it…it’s just the closest comparison I can make to it, I guess. It’s really pleasant and really different. As it starts to cool a bit I’m picking up semi-sweet and semi-dry wine type flavors in the aftertaste but not before I pick up a refreshing celery type hint in mid-sip! Again, this is quite the roller coaster ride and I LIKE it! The cooler it gets I can taste more subtle fruity flavors underneath floral/herbal combo’s. I have to fess-up! I would certainly have identified this as a flowering-type tea because it’s obviously flower contents but I was surprised they have it listed as a Black Flowering Blend as I don’t ‘see’ actual black tea in there – BUT – when you infuse the loose leaf…it’s that of a milder black tea! Very unique…very interesting…VERY strange…I really thing that is why I like this tea because it really made me think…it really surprised me…and it REALLY threw me for a loop! Well Done on this tea! As far as the name goes! Tibet Dream. I certainly have been sitting here – sipping on my new tea from In Nature Teas thinking of the Tibetan People, the Tibetan Monks while looking at my Windhorse Pray Flags displayed on my wall. I dream of peace, love, joy, happiness, and freedom for all! This is a great tea to assist with those positive thoughts and meditations – hopes and dreams – for everyone across the lands! Pu-erh, the great “connoisseur Tea”. The Queen of all Teas, known for its noble palate, taste and aroma. Also famous for its numerous health properties. Yunnan region. This tea brews to a reddish-brown colour and has a distinctive liquorice, soothing taste. This is incredibly smooth…I’m rather shocked at how smooth it is! It’s more like a standard black tea than a stereotypical pu-erh! This would be a nice go-to Pu-Erh. For Pu-Erh fanatics tho, this may be on the lighter side! But for me…I really like this! If you aren’t a fan of the heavier pu-erh’s or the ones that will “put hair on your chest” – try this one! It has been recognised as an effective way to treat the body for several centuries across Asia. It is known to affect directly the digestive and diuretic system. This legendary plant has also been associated with purity and serenity in Hinduism and Buddhism. The Lotus is a native from India and has spread through all the sub continent, South East Asia and China. It is mostly found in ponds and aquatic areas, with its distinctive exquisite blossom flower on the surface. 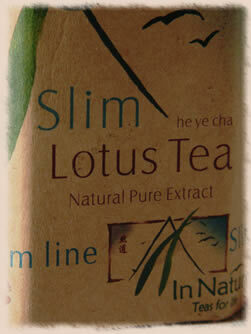 Lotus tea benefits are very well known. For at least two thousand years it has been used by millions of people with very positive results and with absolutely no side effects and indeed all pure and natural. These leaves are HUGE and look like your basic dried leaf from a tree…a light grey-ish green in color. This doesn’t really have a scent to it prior to infusion. Once I started infusing this it start to smell like a cross between asparagus and celery. The aroma was subtle. It’s a clear yet vibrant and brilliantly bright yellow in color. The taste is mellow. One sip sort of reminds me of a light floral taste and the next sip is a tad reminiscent of a celery or a non-bitter dandelion stem type taste. Regardless if I am tasting more floral than veggie or more veggie than floral it is mild, mellow, and pleasant and fairly brothy. I love that this is a new offering from In Nature and a different sort of flower-type tea/tisane. It’s also said to be a slimming tea! For a slimming tea it tastes quite pleasant due to it’s mild flavor. The words Bi Lo Chun translate literally to mean ‘spring snail shell’. The leaves are picked in the spring. Then, when you see this tea, you will notice that the leaves are rolled into small balls which resemble snail shells. When brewed, this green tea produces a yellow-green colour, the fragrance is described as floral and it has a clean and smooth flavour with a sweet after taste. Last week we had our County Fair where I currently reside. The County Fair is a HUGE this for our area here. It also is a sign that fall is right around the corner…and shortly after fall is something I always DREAD…winter! Blah! I’m a fair-weather (minimum) type of person! I don’t like being cold. I would be perfectly fine if it never dropped below the low 70s. Altho I prefer the upper 80s and lower 90s. People say I live in the wrong hemisphere…I mean, I live in the snow belt for Pete’s Sake! I can’t complain tho…it’s been a wonderful summer here! But I can’t help but want to rewind and go back to spring and start the season all over again! Well, lucky me, this tea just SCREAMS Spring!!!!! Bi Lo Chun from In Nature IS very clean, crisp, and sweet yet floral or is it floral yet sweet??? You be the judge! Regardless…this is a lovely green!